Electronic panel of the IBM 701 Defense Calculator, 1952 . 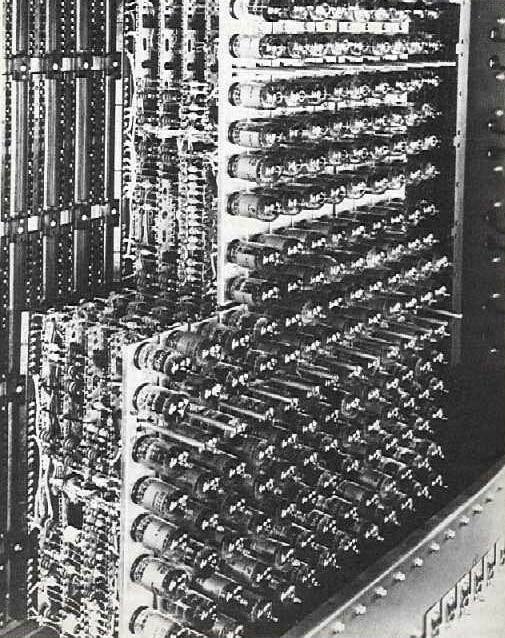 The photo shows 8-tube pluggable units, probably part of the arithmetic unit. A different kind of tube was used for memory storage, the Williams Tube, that looks more like an early TV-set picture tube (thanks to Mark Garrett for pointing this out). A photo of IBM 701 electrostatic storage (CRT memory) is given in Frizzell, Clarence R., "Engineering Description of the IBM Type 701 Computer", Proceedings of the IRE, October 1953, pg. 1286. CRT storage is "accomplished by the [action] of devices similar to a television set; the characters are recorded on the face of the picture tube. Unlike the television set, however, the information stored on the tube is read back when required" .